"Vincent Paris, whose first vintage was 1997, is as shy as his wines are bold. In his early 30's, he has retro sideburns, but not much else in the Cornas appellation's new star is "retro". Vincent's uncle is Robert Michel, one of Cornas' finest growers. He made his two first wines with his uncle then, seeking autonomy, rented facilities for the vinification of his most recent wines. He is in the process of building his own winemaking facilities with a courtyard that holds his apricot plantation. 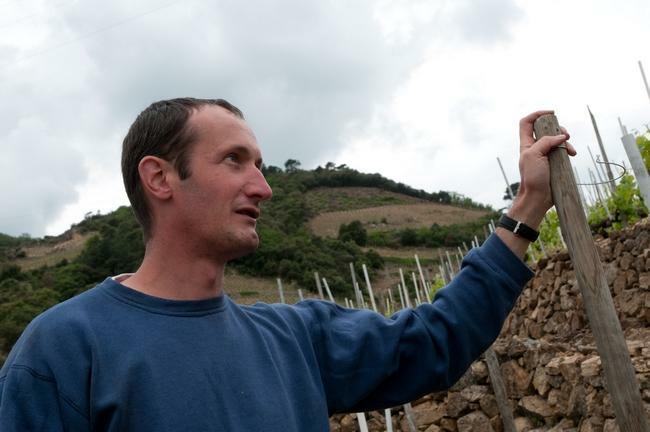 Four years ago he planted Viognier and Roussanne in AOC Cornas, on north-facing slopes he considers better suited for white than reds, despite the fact that in so doing he must sell the wine as Côtes du Rhône since there is no AC Cornas for white. The cuvée is 2/3 viognier and 1/3 Roussanne. 20% of the cuvée is vinified in new barrels, the rest in tank. The Cornas Granit 30 and 60 designations refer to the soil, the approximate age of the vines, and the slope on which they are planted. The Granit 30 is concentrated black fruit in a relatively "consumer friendly"style – perhaps a bit more Syrah-ish than Cornas-ish, whereas the 60 is classic Cornas – dense, aromas of kidney and iron, with a terrific mineral underpinning. His St Joseph red is made from 10 and 20 year old vines, and is vinfied 2/3 in barrel and 1/3 in tank." Wine Advocate 91"The 2017 Cornas Granit 30 features flattering aromas of cracked pepper, ground clove, fresh raspberries and crushed stone. But while the wine is full-bodied, it comes across as slightly austere and lacking mid-palate texture, before finishing long, with hints of Berry Zinger tea." Robert Parker 90"The deep ruby/purple-hued 2006 Cornas Granite 30 reveals a beautifully sweet nose of wild blackberry fruit intermixed with notions of forest floor, underbrush, pepper, figs, and spice. This complex, full-bodied Cornas can be drunk now or cellared for a decade or more."